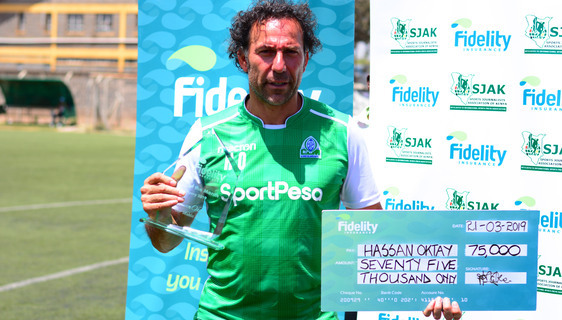 Gor Mahia coach Hasan Oktay has been named the Fidelity Insurance/Sports Journalist Association of Kenya(SJAK) Kenyan Premier League coach of the month for February having led his side to four victories and a draw in five matches that month. This imperious run came even as the club was engaged in two tough CAF Confederations Cup matches, winning one of them 4-2 against Zamalek. “I am happy to get this award. We have been getting good results and improving as a team. I introduced my philosophy, sometimes it takes time but we are slowly getting there,” the tactician stated. Gor produced superb league performances in the month where they began with a 1-0 win away to Vihiga United before silencing their traditional rivals AFC Leopards 2-0 in their subsequent match at the Moi Stadium Kasarani. The 17-time Kenyan champions saw off a in-form Sofapaka 1-0 in their third match at Afraha Stadium but were held to a one all draw by Western Stima in their fourth encounter at Kasarani. K'ogalo defied a numerical disadvantage to edge Tusker 1-0 at Kenyatta Stadium, Machakos in the final match of the month. The Cypriot coach garnered 12 points in a poll conducted by an SJAK panel to beat Bandari tactician Bernard Mwalala who came second with 8 points. Mwalala who was voted the second best tactician in January had guided Bandari to four wins and a draw in the month. Oktay becomes the third recipient of the award in the ongoing 2018-2019 season after Western Stima's Paul Ogai and Mathare United's Francis Kimanzi we're decorated in December and January respectively.